Provide comfort for the family of Marie Jean Bruno with a meaningful gesture of sympathy. Marie I. Jean Bruno was born to the late Mr. and Mrs. Samy and Anita Jean Bruno on October 19, 1956 in Mirebalais, Haiti. She is the mother of Patrick Ganthier, Willia Dubuisson and Marlendia Brutus. Marie is survived by her children, Patrick, Willia and Marlendia; she is also survived by one brother, Louiscene Jean Bruno and five sisters, Marie C. Bruno, Yolande Jean Bruno, Berchoune Jean Bruno, Marie Michelle Jean Bruno and Guerline Jean Bruno. She leaves to mourn her passing seven grandchildren, Alexandrine Byron, Ian Byron, Juliana Adolphe, Marvendy Robert Brutus, Christian Robert Brutus, Eden Charles and Metichela Charles. There will also be a Viewing on Saturday, January 26, 2019 from 8:00 to 9:00am followed by Funeral Service at 9:00 O’clock at L’eglise Alliance Missionaire, 1102-B Blue Hill Ave., Dorchester, MA 02124. To send flowers in memory of Marie I. Jean Bruno, please visit our Heartfelt Sympathies Store. 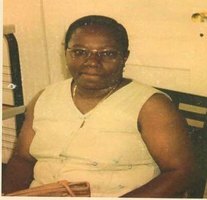 Provide comfort for the family of Marie I. Jean Bruno by sending flowers. Please accept my condolences for the loss of Marie. Death is never an easy thing to accept. The scriptures even refer to it as “the last enemy death, is to be brought to nothing” -1Corinthians 15:26. So we are assured that at some point there will be “no more death” Rev 21:3,4 and that it will be “a thing of the past”. However we are not left without hope because at John 5:28,29 it does say that “there will be a resurrection”. May you find comfort in that hope along with peace.